You've earned a degree in one of the natural sciences with a minor in criminology, or maybe you've received a certificate in forensic science or crime scene investigation from a local community college. You're ready to go to work, but you have no idea where to look for a job in forensic science. If anyone told you that a forensic science career was a sure thing, they lied. While the federal Bureau of Labor Statistics expects there to be better-than-average job growth in the area of forensics and crime scene investigation, popular television shows such as CSI have fostered an increased interest in the field. Some fear the increased interest in crime scene investigation is flooding the job market with candidates, making it harder to find jobs. Finding a job in forensic science can be hard, but it's not impossible. Jobs are out there. You just to know where to look. You also have to be flexible. Understand that there is a possibility that you may have to move to get the job you want or need. Rest assured, though, that with patience and diligence, you'll be able to find a rewarding career. American Academy of Forensic Science: The American Academy of Forensic Science is made up of people who work within all facets of the forensics discipline, including forensic psychologists, criminalists and criminologists, professors, and forensic science technicians. 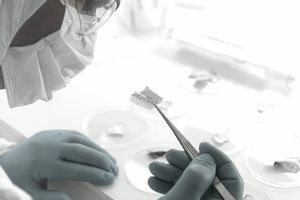 Most useful for those looking for careers in forensic science, though, is the academy's online job listings, featuring employment opportunities all over the United States. Crime Scene Investigator Network: The crime scene investigator network website maintains an active list of jobs in crime scene investigation across the country. Simply go to the employment section to see all of the employment opportunities available. There is also a forum to ask questions of people who are actively working in the field. International Association for Identification: Founded in 1915, the International Association for Identification claims to be the oldest forensic science association in the world. The association's website contains helpful information on training, history and current trends. Most importantly, though, it contains a page dedicated to job listings in forensics. The listings aren't as numerous as some other sites, but the opportunities are up to date. Forensic Magazine: Forensic Magazine is an online and printed media publication that explores trends and technology in the field of forensic science. While its primary focus is on technology, product reviews, and recommendations, the magazine has a section for job listings. You can even sort job listings by specialties, such as forensic engineering or linguistics. Pay close attention to the start and end date on the job postings. The site is kept up to date and postings are continuously added, but some of the ads are older and may have closed by the time you see them. The American Society of Crime Laboratory Directors: As the name implies, the American Society of Crime Laboratory Directors was formed to keep managers and administrators apprised of trends within forensics and criminal justice. Fortunately for job seekers, though, society also features employment opportunities. The jobs listed are a mixed bag of specialized, entry-level and management positions. It may be an especially useful site for those looking to advance their career or move up the chain. Indeed.com: An old standby in job search sites, Indeed.com features a comprehensive job search that allows users to find careers by location, job type, salary, or all of the above. Using a keyword search, Indeed.com allows job seekers to find exactly what they're looking for. A quick search for forensics can yield more than 2,000 possibilities. Career Builder: Like Indeed, Career Builder offers keyword searches and advanced search features that allow people looking for jobs to search by salary or location. Many local newspapers partner with Career Builder for their online job classifieds, making Career Builder a good place to start a search for forensic science jobs in your area. It's important to remember that online job sites are not the be all, end all of the job searching. They're a great starting point to get a feel for what's out there, but they should not be the only tool on your duty belt. Remember to apply the keys to job search success: networking, cold calling, informational interviews, and perseverance. When using online job boards, don't forget to look closely at the opening and closing dates; some job advertisements tend to hang around on the Internet long after they've been filled. Also, take the time to tweak your resume to make sure your qualifications match the job you're going for. With the right combination of diligence and patience, all of your hard work will soon pay off, leading you to a fun and rewarding career in crime scene investigation. Stay focused on the job search, and you'll be working in forensic science in no time.